Well that’s the shortest rundown for you, but you can read all my specific gluten-free lifestyle posts here. 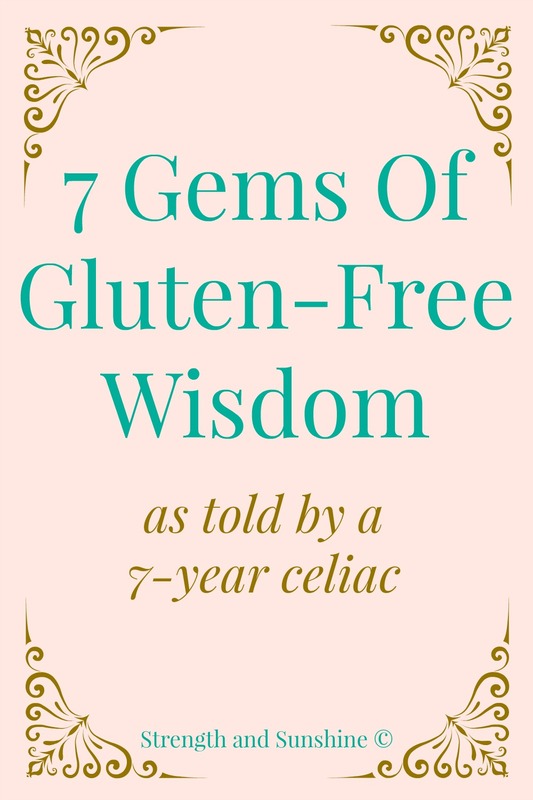 Today, I’m going to share 7 gems of wisdom as a 7 year celiac. 1. Make your first gluten-free meal simple and enjoyable. This isn’t the time to try your hand at a 7 layer gluten-free cake from scratch. That may leave you discouraged and hating your new gluten-free diet before you’ve even given it a real chance. I went with some safe simple pasta. Yes it tasted totally different from good old semolina, but it wasn’t a stressful meal for my first night. I still had all the hope in the world (but really, at that point, any substantial food tasted good!). 2. Your diagnosis isn’t a death sentence, it is an invitation to freedom, health, and LIFE! Your celiac diagnosis just gave you the (mandatory) opportunity to save your own life. You now will have the knowledge and direction you need to follow so you can (and will) be happy ad healthy again! You’re body won’t keep attacking itself 24/7, but will begin to heal and be able to keep you alive! 3. Adapt, accommodate, alter. The triple A’s will be your new motto. You’ll be adapting to your new gluten-free life better and better every day and with every experience. You’ll have to accommodate your own needs as well as help those your interact with, accommodate you. You’ll also be altering just about everything. From recipes to new toasters, but soon enough you’ll be a pro and you’ll be whipping up gluten-free pancakes that deceive everyone (even yourself!). 4. Planning ahead will be a way of life. Even if you’ve never been a great planner, you learn quickly that it’s now a must. Looking at a restaurants menu before hand, packing safe food for trips, always being ready for the unexpected. It may seem like a burden at first, but in the long run, it will actually safe you a lot of time. (Time that would have been wasted being sick on the couch or doubled over in pain in the bathroom!). 5. You’ll become so appreciative and grateful of the safe meals you eat that don’t leave you sick, but leave your soul singing. Depending on how long you suffered with symptoms before diagnosis, you may have a hard time coming to sit down to a meal and trusting that you’ll feel okay 30 minutes afterward. Once you change your diet and learn how to prepare safe healthy foods, you’ll be so grateful for every morsel that enters your mouth, knowing that it will nourish and replenish, not attack and destroy. 6. Food isn’t just food. This can be a good thing and a bad thing. A bad thing because that box of oats is not actually gluten-free. Oats are a gluten-free food, but are sadly cross contaminated (even when they’re “sorted”). Reading labels and doing research on new products will become second nature. Then you’ll realize that the less processed, the better and safer. Whole foods like fruits, veggies, gluten-free grains, nuts, beans, lean proteins, are all safe in their natural form. These foods aren’t just foods anymore. They are the building blocks and essentials to your new healthy and safe diet. The lifelines you can trust and then prepare into beautiful works of art. Trying new produce and cooking techniques will become a joy. You’ll be eating a much lager variety than ever before in your life; a larger variety than those without celiac. Food will not just be food anymore. But a fun, beautiful medicine to heal. You won’t mindlessly be reaching for that cookie in the office lunchroom, but thinking about the choices you make and have to make to continue thriving with your autoimmune disease. 7. It’s not hard, but it’s also not always rainbows and sunshine. Celiac is not hard to manage once you have the proper knowledge and how to live your celiac-safe lifestyle. You’ll learn to be grateful for it. But with that said, there will be hard days, events, and crisis once in a while. You will miss a REAL gluten-packed bagel from your favorite bakery. You will find a substitute, maybe even make your own, but it won’t be the same (of course). You’ll have to deal with people in your life, friends, relatives, coworkers, who just will never understand. You might order some fries without asking about dedicated fryers and become ill. But for the most part, being a celiac will just become another part of you. Like the color of your eyes, it will be there, but you probably once think twice about it going from day-to-day. It’s so ingrained in me now, in my life, that I don’t have to think about being gluten-free or having celiac disease. My other health conditions are more prevalent, and after 7 years, I just don’t have to worry so much about my celiac disease. Everything is second nature and nothing is a hassle anymore. + If you’re a fellow celiac, how long has it been since your diagnosis? + Do you celebrate events like this from days that changed your life? We’re not gluten free, but we have had to make other diet changes due to allergies in our family. Even with that, when I read this post I realized it’s great advice for anyone making a lifestyle change, no matter what the reason. If it’s for medical reasons, allergy reasons, or just because you want to eat healthier. This was just the inspirational post I needed to read tonight! Especially the keep it simple point. I’m always trying to make things more complicated than I need, lol. My nephew has to eat a gluten-free diet. He also has a severe peanut allergy so finding food for him is really hard. I will be sharing your blog with my sister so she can get some ideas for his meals. I’m sure it keeps her on her toes! Thank you so much Becky! Wishing you the best! I wish you wouldn’t feel that way! Wish every passing day it always gets easier! Even after 4 years, it will! Even after 7 for me. Each event and experience that we comes to teaches us how to manage more. It may be harsh at times, but we can usually figure it out. I’m always here to help in anyway I can! Recipes and food/cooking tips…I’m there! It’s the only way to do it! Some great advice, Rebecca! Thanks for sharing. 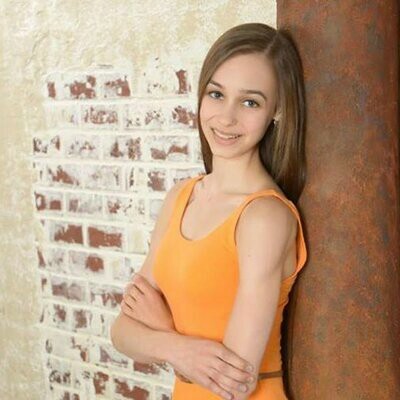 You are quite an inspiration Rebecca! 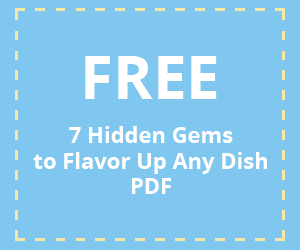 Great information… I dont need to be gluten free, but I have friends who need that so this is very helpful! I think my husband might have an intolerance but like a typical guy, he won’t get it looked at. Trying to find gluten free options to fit into our everyday meals and choices. Congratulations on your success! Thanks for the tips. Exactly 😛 But It’s so true! A positive attitude such as yours is the most healthy way to live. Congratulations! I’m not totally gluten-free, but have certainly altered my diet to eliminate most gluten. It’s a good feeling. I love your positive attitude! My son is in the process of being tested for Celiac disease. We have a strong family history of it, so I won’t be surprised if he is positive for it. Like he says, at least he can still have (many kinds of) ice cream! Once he knows, he can be so much happier and healthier! And yes! He won’t miss out, there is always an alternative! What a positive read Rebecca! I love how you “actually jumped and ran with it”. You accepted your situation quickly, investigated and read up on your alternatives, and you carried on with your life in a positive and inspirational manner. I hope people that are reading this, and having to come to terms with a similar situation themselves DO THE SAME! I would! Great tips! Such great tips! Love the triple A’s! It is great Rebecca that you have put a positive spin on gluten-free which will encourage others. This has to be so inspirational for anyone who has just been diagnosed. It inspired me! Great post, Rebecca. I definitely recognize those pivotal moments – especially the rock bottom ones that have led to huge changes! Changing my diet has completely changed how I feel and I no longer worry about being sick, which is just an amazing feeling. It’s so worth it and there is a whole world of amazing food out there that I never would’ve known about. So happy for your 7 years of health! Thanks Michele! And yea! I always talk about all the amazing food and cooking I’ve gotten to experience now! I mean…I don’t know if I would have ever started this blog or eaten plantains and yucca 😉 Hahahaha! It’s been about 2 years since I was diagosed with celiac and, though I haven’t had a “celiac birthday party” or anything like that, I do reflect in May on how far I’ve come. Wow Rebecca – I didn’t realize you were in 8th grade when you got your diagnosis. Lady, you have come a long way – and you turned around and are helping so many others through this space of yours! Thanks Shashi! Right when all the crazy adolescent hormones come to a head, those things tend to manifest full force! Once you know how to swap things and learn about cross contamination, its not hard at all, haha! Want pasta? Use gf pasta! Want bread, just use gf bread! And yea….I needed to heal….I needed to eat real food again! Hahaha! Hi Rebecca. Your comments on oats really got my attention. I researched it extensively the only oats I buy are Bobs Red Mill. Gf begins on the farm and end with the packaging. I guess the true test has been that I’m eating them without a problem. That HAS NOT been the case with other oats. I didn’t know you had celiac disease. There are only a few certified manufactories I trust. Most notably and the best producer GF Harvest. great tips! i think adapting is definitely key! and keeping it simple at first. Taking it slow and steady! Celiac isn’t my only problem though. I still am on a journey here! Every bit we can know for certain sure is a blessing in disguise! I don’t have Celiac but my husband does. However it has made for a huge life change for both of us. We started gluten free living barely over a month ago so it’s all still quite new. While it’s still rough for us to adapt we are really enjoying “getting to know” our food more and eat for nourishment. We have lot to learn but I’m so thankful that he has an opportunity to feel well and find freedom in his health. Thanks so much for this post! It all gets so much easier and is definitely easier when someone has the support of the family so its wonderful you’re helping keep him safe! You make some great points, which I can definitely relate to. It’s not the most difficult thing in the world to manage celiac (there are much worse situations) but it’s not a walk in the park! Even today with a lot of GF products, it’s still difficult to eat out and live with others. But I make it work. Being gluten-free is the least of my problems! My other restrictions are a way bigger part! Haha!